Meanwhile Simon is exploring the Scottish island of Islay, in the Hebrides. From his own farm location he follows the stories of some of the UK's most special animals, from golden eagles to corncrakes and choughs. He also takes a closer look at one of the UK's most prolific inhabitants, the rabbit. See them as you've never seen them before! So what if you don't have a television or can't receive the BBC, is there anything you can watch on the internet? 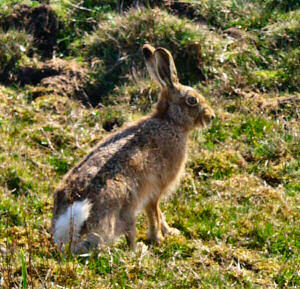 Looks like it: There are some highlights listed on the Springwatch overview page (which is the reason for the hare picture above, there's a video of hares boxing on Islay). Then there are Webcams, which include an Islay Golden Eagle. Enough watching, is there anything to read? Sure: The BBC reports Scottish wildlife to star in show. The Daily Record writes Cameras Swoop On Family Fortunes. And the RSPB explains Eagle eyes are on Islay as BBC wildlife series goes live. Enough reading, I'd like to discuss? Well, there's a Springwatch thread at the BirdForum (requires registration to discuss, but is open to read). And finally: If you plan to visit Islay to try to see some of it yourself after watching it on TV, the two RSPB reserves where some of the filming takes place are The Oa and Loch Gruinart.